Shopping for Bob the Builder Construction Toys? Can we build it? 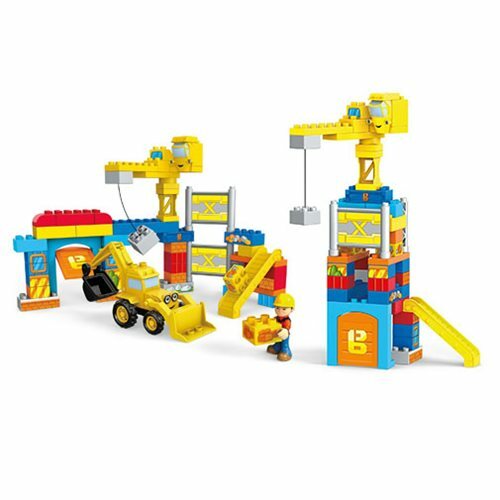 Yes, we can… with the Bob the Builder Work Yard Build-Up Set! No job is too big for Bob and his team. Build Bob's Work Yard, and then open the garage door to haul in your blocks or send them down the chute to get ready for the job. Then help Bob carry blocks while Scoop shovels and Tiny rotates to sling rocks around. When you're all done, rebuild it into a sky-high skyscraper for the team to use tower power to finish a new job! Ages 3 and up.